Developer: Konami Computer Entertainment Japan (KCEJ), Tose Co.,Ltd. Metal Gear Solid, released as Metal Gear: Ghost Babel​ (メタルギア ゴーストバベル, Metaru Gia Gōsuto Baberu) in Japan and Asia, is a 2000 stealth action game produced by Konami for the Game Boy Color. 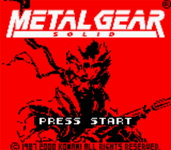 Based on the 1998 PlayStation game of the same title, the Game Boy Color version of Metal Gear Solid (or Ghost Babel) is not a conversion of the previous game, but an original game produced specifically for the portable platform. The story of Ghost Babel is not set in the same continuity as the original Metal Gear Solid, but instead serves as an alternate sequel to the events of the original Metal Gear, set seven years after Solid Snake's mission in Outer Heaven. Source: Wikipedia, "Metal Gear Solid (Game Boy)", available under the CC-BY-SA License.